We have highlighted below the summary of the grading criteria. You will notice that each grade level in the beginning can be attained every 3-4 months. This is set up this way so that a student can be assessed in smaller steps as they start out their karate journey and begin to learn all the new skills (strikes, blocks, stances, kicks, kata). 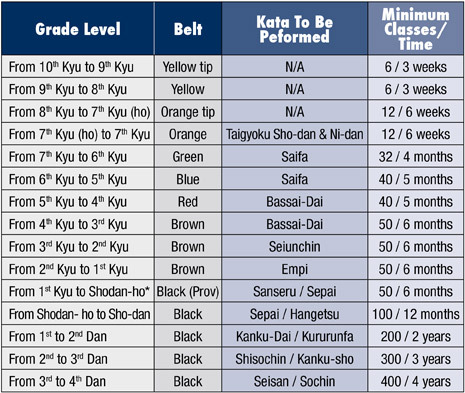 The diagram below shows the kata to perform, and how long it takes to proceed from one grade to the next. The number of classes shown are the minimum number that is generally required to proceed, and the minimum time required is also factored into the grading process. Ultimately the instructor is the person responsible for assessing when a student may be ready to attempt the next grading. NB: These minimum class numbers and time frames are guidelines only. Eligibility for grading will ultimately be at the discretion of the Instructor.